Welcome to Dogwarts University Gromit graduated. Existence and activity of our university had been behind closed doors for a long time. Aardman studio has opened the doors by the release of the film "THE CURSE OF THE WERE-RABBIT" without our intent. 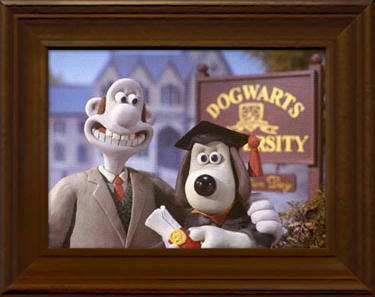 I protested against Nick Park but the photograph of Wallace and Gromit at the graduation ceremony was so nice. I wanna hang it in my office.